To capture the screen of one or more monitors, press the Print Screen button on your keyboard. This is helpful if you are using multiple monitors. Click the window to make sure it’s active. Press and hold the Alt button on your keyboard, and press the Print Screen button. Click the window you want to capture. The most powerful way to capture a screen sample is to use the Snipping Tool that is included with Windows Vista, Windows 7, and 8. To use the Snipping Tool, lasso the part of the screen you want to copy. To “Lasso,” click on one corner of the window, but hold down the mouse button once you click it. Then drag the mouse diagonally to the opposite corner and let up the mouse button. After you have captured your screen sample, paste it into Microsoft Word, Outlook, or Paint for editing. A quick shortcut to paste the screen sample is CTRL+V. Once you have mastered these skills, it is easy to report something on your PC to your IT department, by putting screenshots into a Microsoft Word document. Below each picture, type a description of what is happening. Want to capture a copy of your screen on your smart phone? Google the make and model of phone you have, followed by “screen capture” or “screenshot” to get the key combination that you need. 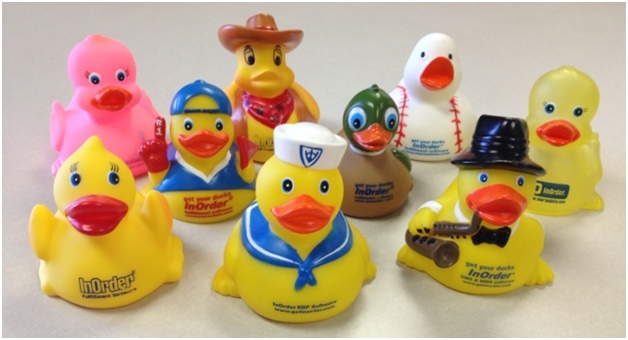 The rubber duck was inducted into the National Toy Hall of Fame this year! Check out the details here http://www.toyhalloffame.org/toys/rubber-duck. Of course, we think it’s cool. We put a lot of thought into our selection of rubber ducks each year. Do you have a favorite?